Since 2006, KEDI Healthcare has brought true Health and Wealth to Africans in particular, and the world at large. Starting from Nigeria, Ghana, South Africa, and many other countries, our safe, natural, and highly effective healthcare products are being used by every person that truly values Health as an asset. Now is the turn for Keyans to tap into this world of unlimited opportunities in the areas of Health and Wealth as provided by Kedi Healthcare. Welcome to real Health and Wealth Unlimited. Kedi Healthcare is a wholly owned subsidiary of KEDI Healthcare Industries Company (Hong Kong) Ltd. Kedi Hong Kong, located in Hong Kong is in China, the world famous free trade port, financial center and special administrative region of People's Republic of China, is a giant conglomerate with business interest in pharmaceuticals sector in China. It's subsidiaries include Kedi Healthcare Industries Nigeria Ltd., Kedi Healthcare Industries Ghana Ltd., and a joint venture company with two other pharmaceutical companies named YFK Pharmaceuticals Ltd. 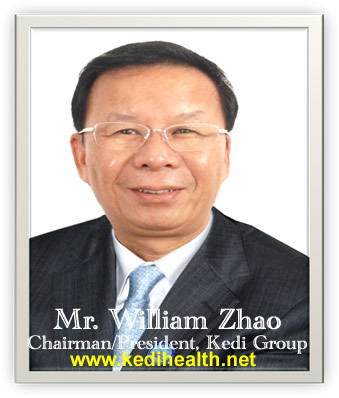 The management team of Kedi Healthcare is headed by Mr. William Yanming Zhao, a professional senior manger with rich experiences. In the past two decades, he has worked in various state owned companies and foreign companies in very top capacities. In the year 2000, Mr. William Zhao came to Africa as the Managing Director for Africa and the Middle East in a multinational company with Chinese background that is committed to health projects in Africa. Mission Statement: Kedi Healthcare commits itself to promote Traditional Chinese Medical culture worldwide, to introduce the quintessence of Chinese Medicine - herbal medicament, and to contribute to well being of mankind. Perspective & Vision: Kedi Healthcare will set up TCM Pharmaceutical factory, TCM Hospital, and Chinese Herbal Medicine Research Institute worldwide. In Kedi Healthcare, we remain focused and totally commited to the mission and perspective/vision of Kedi. The development of this website is therefore one of the cardinal ways to ensure that all humans have access to Kedi Healthcare products and Multi-Level Marketing plan irrespective of one's place of residence, country, or continent. KEDI HEALTHCARE PRODUCTS is in deed the best in providing curative, restorative, and preventive healthcare solutions to health challenges like Hypertension, Diabetes, Stroke & Paralysis, Fibroid, Cancer, Ulcer & Gastritis, Asthma, Tuberculosis, Pile, Male/Female impotence and infertility, Arthritis & Rheumatism, Painful Menstruation & disorders, Weight Control & Management, disorders of Lungs, Heart, Kidney, Liver etc. Other areas are: Body Immune Boosting & HIV Support, Anti-Aging, Anti-Virus, Anti-Bacteria, and a lot more. Join the Kedi Big Family now and begin a life of health and create wealth as well. You can become One Of Our Partners And Begin a Sure Journey of Health And Wealth. All products here are Guaranteed & Assured of KEDI mark of Quality.